Sounds interesting, right? That’s what I thought when I first came across this hearty salad. I think I’ve said it before, but I rarely like salads to be my main course. I LOVE them as a side, but do not prefer them as the star. However, when I saw this salad I thought that, while it sounded interesting, it also sounded hearty. I mean, I still get my steak and potatoes! This was a SUPER easy way to prepare both the steak and the potatoes. I used the microwave and one skillet to achieve a freshly seared steak AND crispy potatoes. While I seared the steak, I popped the potatoes in the microwave to give them a head start (you’ll want to avoid having raw insides and burnt outsides). By the time the steak was ready to rest, the potatoes were ready to be added to the skillet to finish cooking . . . not to mention they were infused with a meaty flavor from the browned bits left behind by the seared steak. Talk about delicious! I really loved this salad . . . even as my main course. It was LARGE, meaty, and filling. Oh, and very tasty to boot! Transfer the steak to a carving board, tent loosely with foil, and let rest for 10 minutes. Cut the steak across the grain into 1/4-inch-thick slices. Meanwhile, toss the potatoes with the remaining 1 teaspoon oil in a large microwave-safe bowl. Cover the microwave on high until the potatoes are tender, 5 to 10 minutes, stirring the potatoes halfway through the cooking time. Return the skillet to medium-high heat until just smoking. Add the potatoes in a single layer and cook until well browned on both sides, about 5 minutes. Season with salt and pepper to taste. Whisk the dressing to recombine. 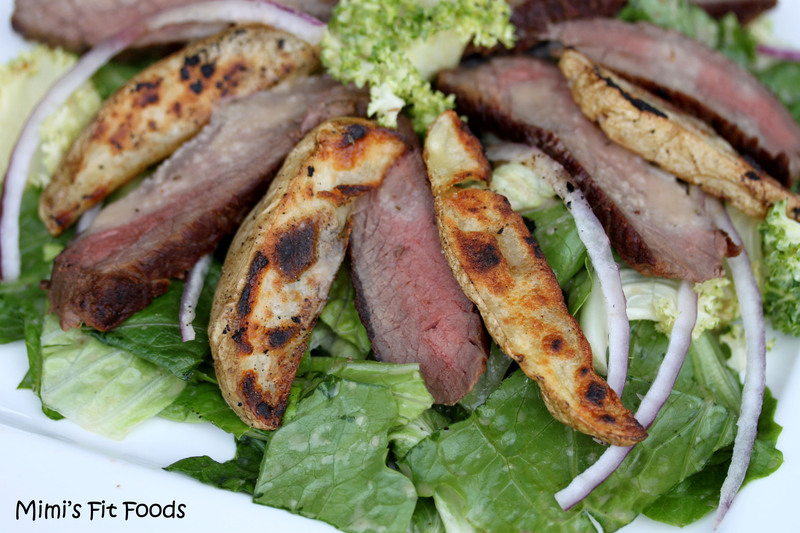 Toss the lettuce and onion with 1/2 cup of the dressing, then divide it among four plates. 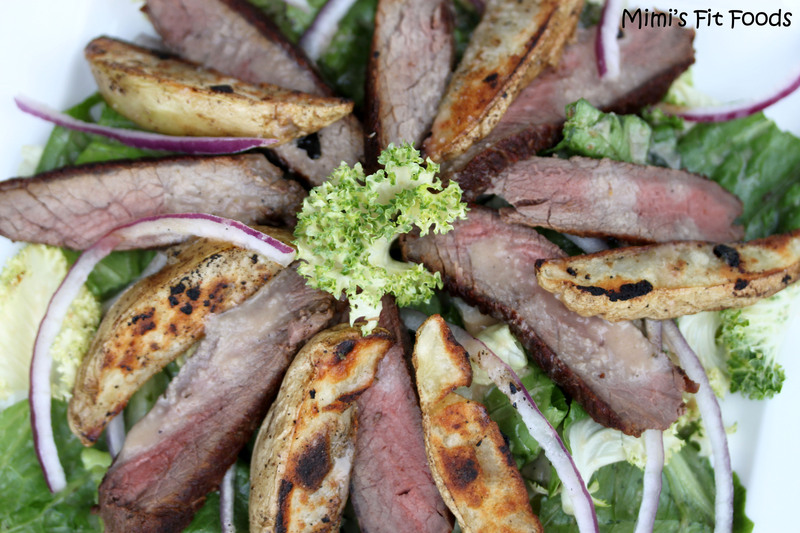 Arrange the steak and potatoes on top of the salads, drizzle with the remaining dressing, and serve. Everyone absolutely loved this! The kids even commented on how much they liked the dressing (my kids don’t like much!) We are making this for family that are visiting from out of town. Thank you for all the great recipes! Thanks for your comment! So happy you loved it! We did too and I think it would be GREAT to serve to company.